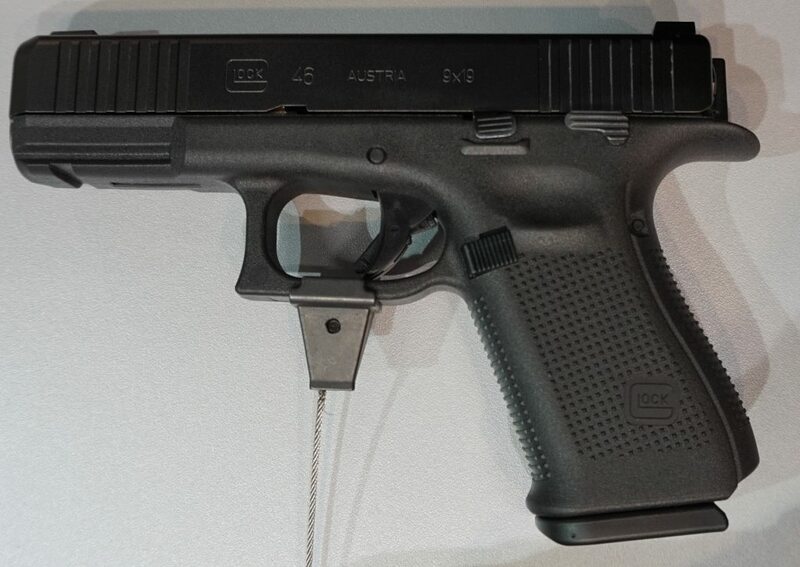 The Glock 46 Pistol was first announced to the German press in 2017. In early 2019 it was formally adopted by the police force of the German federal land known as Sachsen-Anhalt. 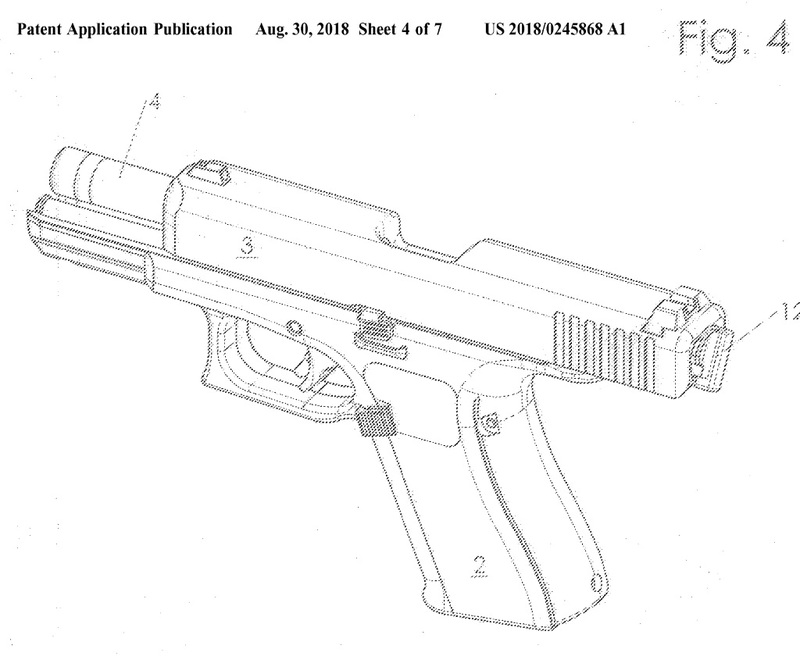 this was in order to replace their aged SIG Sauer P6 / P225 pistols. Despite obvious external similarities, the Glock 46 pistol is sufficiently different from Glock 17 and all of its descendants to warrant a separate entry. Designed specifically according to the technical requirements of German police forces, it is not yet available for commercial sales in Europe or in the USA. This new system, at least for time being, is only available in one size and in only one caliber – 9x19mm. 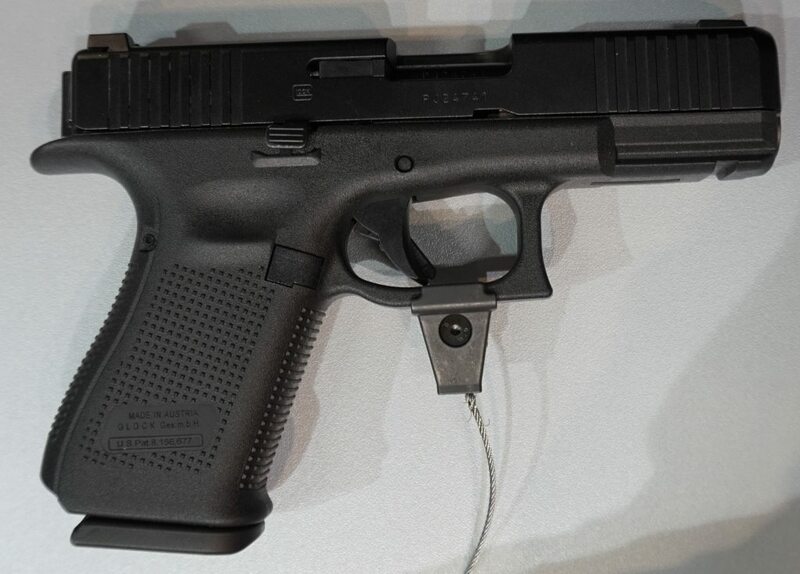 The Glock 46 pistol is a short recoil operated, locked breech handgun. Unlike all other previous Glock models, it uses rotary barrel locking (broadly similar to older Austrian pistols such as the Steyr M1907 or M1911), whereas other Glock pistols utilize tilting barrel locking. According to the Glock company representative at IWA-2019 show, this system was selected to ensure lower bore axis and smoother recoil cycle, when compared to ‘classic’ Glock pistols. Another major difference is in the design of the trigger unit. While the basic trigger operation is the same as other Glocks, similarly using a pre-cocked firing pin and automated trigger safety, the striker system is completely redesigned. More importantly, it has a completely new disassembly procedure that for safety reasons does not require the operator to touch the trigger at all. To disassemble an unloaded G46 pistol, the operator has to lock the slide in the open position manually, using the slide stop lever. Once the slide is locked back, then the ‘special switch’ located at the rear end of the slide has to be rotated. This switch disengages the firing pin from the sear and allows the slide (along with barrel and return spring) to be carefully released forward until it can be pulled up from the frame rails and out of the gun. To release the slide, user has to depress a small lever on the left side of the frame, behind the slide stop (this lever was previously mistakenly identified as manual safety). As such, the slide and frame of the G46 pistol are not compatible with other Glock pistols of a similar size and caliber. The Glock 46 pistol frame also features a more pronounced beavertail than the Glock 17, removable grip backstraps and a widened magazine well for quicker reloading.